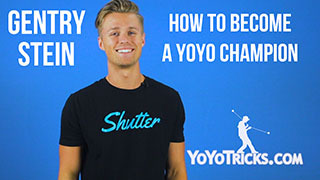 In the second installment of the How to Become a Yoyo Champion video series, World Champion Gentry Stein gives an overview of the basic rules of yoyo contests and the modern judging format. How to Become a Yoyo Champion: Vol. 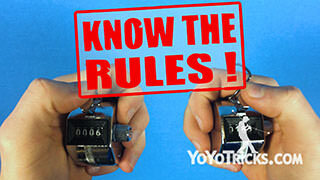 2 Know the Rules Yoyo TrickThis is the 2nd video in the “How to Be a Yoyo Champion” video series. 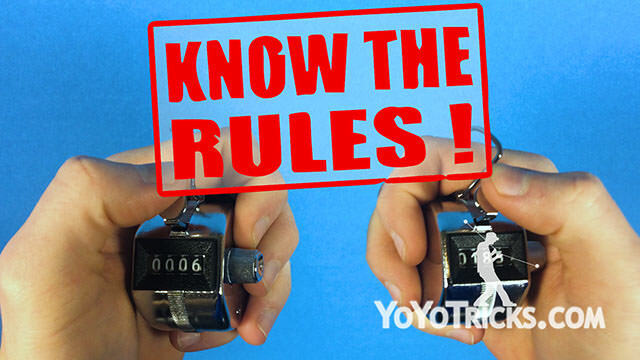 In this video, we’ll be going over the judging system and the rules of competitive yoyoing. In the third and fourth videos we will go into even more detail about how to construct a routine that scores well, but for now we will just be giving you an overview of the entire system. To start, it is highly unlikely that you will win a contest if you don’t understand the rules. It’s easy to think that all it takes to win is hitting a bunch of cool tricks, but without a good understanding of the judging system you may be performing tricks that don’t even score. You will also be missing out on other aspects of your routine, like the performance evaluation, that can be the deciding factor between a win or a loss. The best way to get started is to head over to yoyocontestcentral.com/rules and read through the entire description of the judging criteria. In the next few videos I’ll be going into depth about the most important aspects of the judging system, but this should not keep you from reading the rules for yourself, because we will not be covering everything in these videos, and because the rules are updated nearly every year. You want to be as current as possible or you may find yourself scoring well below your potential. The scoring system is separated into three Categories: Technical Execution, Technical Evaluation, and Performance Evaluation. Currently, the technical execution section makes up 60 percent of your final score. You’ll receive points in this section by landing tricks. The individuals who judge this category will each have two clickers, one in each hand. In one hand they will give you positive clicks as you successfully land trick elements. In the other hand they will give you negative clicks for every element you attempt and miss, or for a loss of control of the yoyo during your routine. When you see your technical execution score at the end of a contest, the maximum score you can receive is 60. This is because the scores in this category are normalized. The player who has the greatest number of total clicks at a contest will be awarded 60 points, and all the other players scores are averaged based on that person’s clicks. So if you go to a contest and have exactly half the number of total clicks as the highest scoring player, you will receive a technical execution score of 30. Because of this it is not useful to compare your own scores from one contest to another, since these scores are not absolute, but are based off the best player present at each contest. Usually at a contest there is more than one individual clicking for technical execution. The normalizing of the scores happens BEFORE the judges scores are combined. So if two judges disagree over who had the greatest number of clicks, they will each be awarding the full 60 points to a different player. Once their scores are normalized, THEN all the judges scores are averaged together. This is why sometimes the highest scoring player does not receive the full 60 points – because one or more of the judges clicked a different player higher. This is actually pretty common at yoyo contests. Next on the score sheet you will see your scores for technical and performance evaluations. These sections are scored by a different judge or set of judges than the technical execution section. In the evaluation sections your scores will be awarded on a 0-5 point scale. Currently, the there are three technical evaluation categories, so combined they are worth 15% of your final score. There are also five Performance evaluation categories, so combined they are worth 25% of your score. We will be going into more details about these sections in videos three and four of this series. The last thing you will see before your total combined score are your major deductions. There are three ways to receive a major deduction. If at any point the spin dies on your yoyo you will be deducted 1 point. 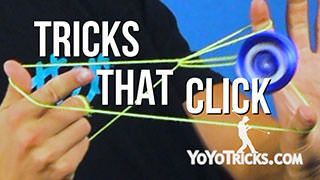 If you change out a yoyo (usually because of a knot) you will be deducted 3 points. If your string breaks during your routine you be deducted 5 points. Finally, if your yoyo leaves the stage endangering the judges or the audience, you may be disqualified. As we mentioned earlier, it is important to read the current set of rules for a contest because often enough small changes are made to the rules that can have big consequences for your score. For example, recently the Variation eval category was changed slightly, and renamed Trick Diversity. Variation only considered how much variation there is between your trick elements, while Trick Diversity focuses more on how your tricks are presented, but still considers both. A player who had a very diverse set of tricks, but who performed them all in a way that was visually similar might be surprised to see their score drop in this category if they had neglected to read the rules. To cite one more example, back before 2012 there were no major deductions for restarting or swapping yoyos. After major deductions were added, a player who was consistently winning contests despite frequent restarts or yoyo changes would find themselves much less likely to win under the new system because so many points would be removed from their final score. Another reason it’s important to read and re-read the rules every year is because there are still a number of long held misunderstandings about the rules that could lead to creating a low scoring routine. For example, it was common for players to think clicks were given for the yoyo hitting the string. While string hits CAN be a scorable element, a player who holds to these ideals will probably not put as much thought into trick variety and difficulty as necessary to create a high scoring routine. Some players also feel that newer tricks should be awarded more clicks than tricks that have been performed at previous contests. While the introduction of a completely new trick concept can impress the judges and audience, there is actually nothing in the current judging system that says newer tricks should be scored higher than older tricks. The best way to be confident your routine will score as high as possible is to know the rules. 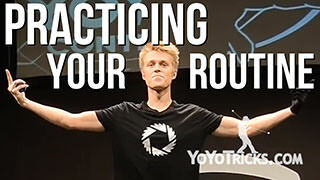 Once you know the rules you will have a much more solid foundation for becoming a yoyo champion.